Kai's Power Tools special effects filters were once considered a must-have plug-in suite for Photoshop-compatible graphics software. In 1999, Corel bought Kai Krause's popular effects filters from MetaCreations and soon released a new set of effects under the title Procreate KPT Effects. Building on the classic special effects from KPT 5, KPT 6 and KPT 7, Corel added nine new filters to expand creativity. Later, Corel combined all the classic effects along with the new effects into one complete collection—The KPT Collection—with 24 filters in all. In time, The KPT Collection, a 32-bit plug-in, became a free download for PaintShop Pro owners. Corel no longer develops or sell The KPT Collection. In time, The KPT Collection, a 32-bit plug-in, became a free download for PaintShop Pro owners. But with the growth of 64-bit computing, the KPT Collection became obsolete. KPT Channel Surfing, which splits an image into RGB and HLS color channels and lets you apply effects such as blur, sharpen, contrast and value shift to one or all channels. The KPT Fluid filter applies liquid-like distortions that simulate dragging a brush through fluid. The controls allow you to adjust the thickness of the liquid, brush size and velocity. KPT FraxFlame II creates and explores flame fractals that resemble colored light. Customize the effect by choosing from seven styles, editable gradients, and infinite genetic mutations. Use KPT Gradient Lab to design complex color blends and gradients by mixing shapes and colors in multiple layers with advanced blending and precise positioning. KPT Hyper Tiling transforms images into intricate tiling effects. Choose from five styles and customize the effect with transparency, advanced blending, and precise positioning. KPT Ink Dropper simulates liquid ink on a surface to create water spots, smoky swirls, and stains. Options allow you to customize the ink color and drop settings such as diffusion, movement, and dispersion. The KPT Lightning filter creates lightning bolts with complete control over position, size, forkiness, glow, and color. KPT Pyramid Paint uses the Lab color mode to reduce and separate the colors in an image to resemble a painting. 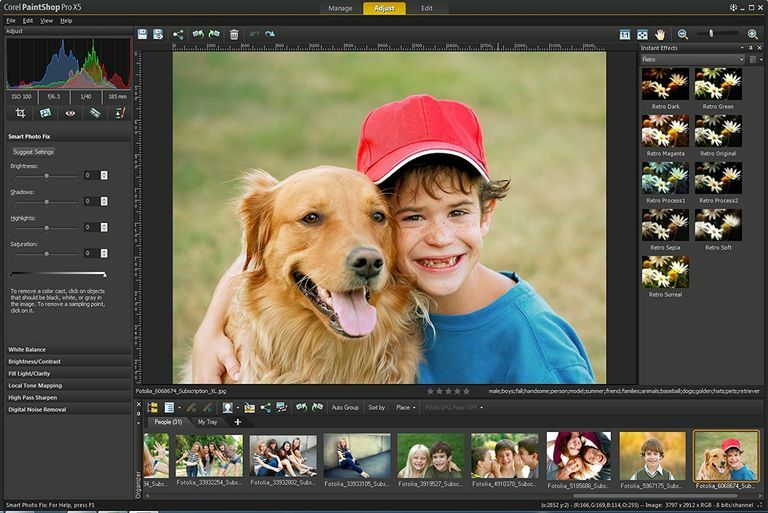 Users can adjust individual color components, saturation, hue, contrast, and lightness. KPT Scatter distributes particles over a source image in a variety of ways with control over placement, color, and shadow. Any transparent image can be used as a particle. The KPT Collection is available only as a PaintShop Pro 32-bit plug-in.